As part of the visit to Australia by Dr Florian Menter, world-recognised expert in turbulence modelling, LEAP Australia is pleased to announce a webinar to be held on Thursday Aug 30th at 11am AEST. This webinar will provide an overview of recent advancements in turbulence modelling and is being held for those customers unable to attend the Advanced Turbulence training courses in Sydney, Melbourne and Perth. More information on the training courses can be found here in a separate post. Who should attend? This webinar is suitable for all engineers, researchers & managers involved in performing CFD modelling of turbulent flows. Dr. Menter is a world-recognised expert in turbulence modelling. He developed the widely used Shear-Stress Transport (SST) turbulence model, which has set a milestone in the accurate prediction of aerodynamic flows. He has also contributed to the formulation of one-equation turbulence models, advanced near wall treatment of turbulence equations, transition modelling and unsteady flow models. 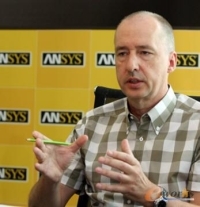 He has been in charge of the turbulence modelling program at ANSYS for more than 15 years and has been involved in a wide range of industrial modelling challenges. He has published more than 50 papers and articles at international conferences and in international journals. Most recently, Dr. Menter has been involved in the implementation of new turbulence models for unsteady flow simulations, including Scale-Adaptive Simulation (SAS) and Embedded/Zonal LES models. These models are particularly relevant for the many industrial applications where time varying information is essential to the engineering outcomes (such as aerodynamics, acoustics, combustion, fluid-structure coupling, etc.). For more information, please phone LEAP on 1300 88 22 40 or (02) 8966 7888 (from mobiles or outside Australia) or email us. Full login details for the webinar will be provided upon registration. I'm using your SST model (ANSYS CFD solvers) to simulate swirl flow within a spilt channel. Can you tell me about the modification of SST model to smulate swirling flow? The ability to model swirling flow with a 2-equation RANS model is greatly improved by using the curvature correction implementation of the SST model. More information will be presented in the training courses being held next week in Sydney, Melbourne and Perth, as well as briefly in the webinar mentioned on this blog post. Thanks for your interest. If you have further questions, please contact LEAP's technical support team. Will a recording of this webinar be posted online? Hi Dan, thanks for your interest. We have emailed you directly with a link to the webinar recording. Please could you send me a link to this webinar recording too? May you please email me a link to the webinar? If you could email me a link to the webinar as well I would really appreciate it. I realize this is an old post but this is an interesting and relevant topic for me currently. Thanks! Could you please email me a link to the webinar recording? Is there an easy way to get links to all of the recent webinars? Hi, I'm also interested in the recording to this webinar. Please, could you send me the link too? Hi, I’m also interested in the recording to this webinar. Could you send me the link too? I know I'm a little late to the game, but can I also get the link of the webinar recording. Also would just like to say that I really enjoy your blog!